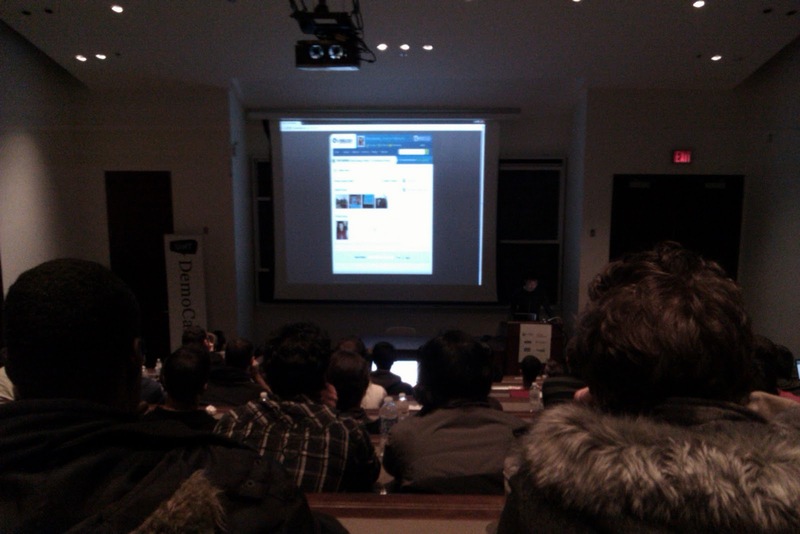 On November 23, 2010, I was lucky enough to be able to attend the latest Demo Camp at UofT, an event that allows the school's up-and-coming developers and hackers to showcase their work in front of an audience - in most cases for the very first time. I must say, I was thoroughly impressed and inspired by the experience. To be surrounded by some of the brightest young minds in the tech industry - many of whom are also entrepreneurs and no doubt future business moguls - was humbling to say the least. Over the next few posts in this series, we'll take a close look at some of the projects that were presented - I'll describe what it is, talk to the insight that makes it great, and then briefly comment on what could be done to improve it. By being exposed to some of these emerging applications and the ideas within them, I hope that you will be inspired to use lateral thinking to figure out how you can apply the insights presented here to a project that you're working on. Worth paying for - no matter what! Ever attended an event like a baseball game or an exhibition, and wished there were a better way to stay engaged with what was happening and navigate the agenda? Ever been to a conference and wished there was an improved way of networking and quickly getting more info on the person speaking? In the past, you'd have to carry around a program or two, perhaps a map of the show floor, and several copies of the agenda. At a sporting event, you'd have to waste time and money trying to text responses to a short code in order to participate in live polls or contests. In a word, the experience was often cumbersome. What if you could use a device that you're already carrying around with you - your smartphone - to stay connected and interact with an event while it's happening? The first demo was of an Mobile Web App called EventMobi, presented by the software's lead developer, Bijan Vaez. The first thing that got my attention was that this application was the one that UofT Demo Camp used to register attendees for the event itself. I remembered working through the web browser interface as I registered my name and checked out the agenda. What EventMobi is, in a nutshell, is a smartphone application that allows attendees to stay engaged at an event - and a way for event organizers and speakers to engage attendees. The second thing that got my attention is that this is not a native smartphone application - I did not have to download anything to my Android phone to make it work. Unlike custom-designed event applications like those developed for Scotiabank's Nuit Blanche festival and the Santa Claus Parade, which are quickly downloaded to use for the duration of an event and then just as quickly deleted, this web app worked seamlessly through my mobile web browser. All you have to do is go to the event's EventMobi page and there you are - a website that operates more like an app. What can you do once you have it on? You can view full details of the event's agenda, including times, locations, and descriptions of each session (say good-bye to lugging around a paper agenda!). You can view a list of others who have registered to attend the event (great for networking and follow-ups!). You can view the list of event speakers and read their bios (good for helping you avoid those "What's her name, again?" moments). You can view the event sponsors, live feeds from Twitter and Facebook, and event participate in live event surveys (with instant, live results). You will even be alerted if there are any last-minute changes to the agenda - for example, if a session changes rooms. Brilliant. What a simple and innovative way to stay engaged with an event. Having already skimmed through the EventMobi web app as I was waiting for the Demo Camp to start, I was already sold on how useful it could be. Combine that with some of the most interesting features - being able to participate in live polls (and see the results unfold on the screen in front of everyone) and view live feeds - and this is an app that I'd like to see used by all future events that I attend. What do you think of EventMobi? Stay tuned for even more goodness in EventMobi... our goal is to make EventMobi the mobile app of choice for any type of event, regardless of size and budget. We are seeing a huge shift in trend and our belief is the same way that online registration is a must these days for any event, mobile apps will also become a necessity as they will revolutionize the way attendees interact and consume information at live events. I think EventMobi is a great example of thinking in terms of "platforms" instead of just "applications" when it comes to new types of software. The core concept of adding a more social element to events through one's Smartphone is something that's innovative and widely applicable. I'm excited to see where it takes you and your team.